Last week, the unemployment report came out for July. The U.S. added 255,000 jobs, more than economists had forecast, and suddenly the economy is doing great, everything is back on track, and the Federal Reserve is likely to raise interest rates later this year. If you follow the economy through the daily media or the gyrations of the stock market, you are likely suffering from whiplash. Up one day; down the next. We’re in a recovery; no, we teetering on the brink on recession. Ouch, my neck hurts. Sometimes, it is useful to take a step back, look at the big picture. But if you do that, be prepared. You might wind up with more than just a crick in your neck; you are more likely to experience pain deep in your gut. 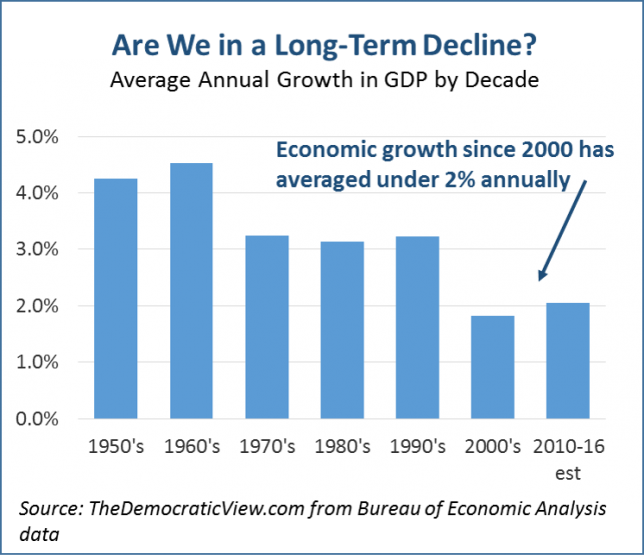 As shown in the accompanying graph, economic growth in the U.S. has averaged just about 2% in the last decade and a half. That’s down from more than 3% in the 1970’s through the 1990’s and more than 4% in the 50’s and 60’s. The latest figures for the first seven months of 2016 have the economy growing just 1% year over year; optimistically, the very best we are likely to do is 1.5% to 2% in 2016. Many Democratic politicians, President Obama included, would have you believe everything is fine, even as they reluctantly acknowledge that perhaps wage stagnation for the vast majority of Americans is a problem. Well … yea. Why the long-term economic slowdown with wage stagnation as its core? The answer is obviously complex. Economists and talking heads debate whether the cause is increased international competition, bad trade deals, a decline in worker bargaining rights, loss of manufacturing, slackening consumer demand, automation of the workplace, or all of the above. Well, all of those factors no doubt contribute to the economic malaise the U.S. finds itself in today. But there may be an overarching cause that very few really talk about – political dysfunction. That is not just something that happened in the past. Now and in the future, political dysfunction and outright mismanagement of the economy continue to pose a threat to the security of all Americans. Economic policy has two major components – fiscal and monetary. Largely due to the dysfunction of the U.S. Congress, one of those, fiscal policy, is virtually non-existent. It is not just that Congress can’t pass a budget. Essentially there is no coherent fiscal policy; no guiding principles by which to foster growth and prosperity, and our economy as a result is at serious risk. It’s a big problem. It not getting near enough attention. It needs to be talked about more, and it needs to be fixed.